Seasoned sausage meat made with British pork wrapped in puff pastry. Made with pork, outdoor bred with care by British farmers who share our values. 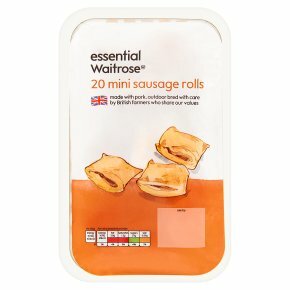 INGREDIENTS: pork (29%), fortified wheat flour (wheat flour, calcium carbonate, iron, niacin, thiamin), water, palm oil, pasteurised free range egg, salt, potato starch, onion, pork fat, rapeseed oil, black pepper, dried thyme, dried sage, white pepper, mace.